Carnival Legend has joined her sister ship, the Spirit, in sailing out of Sydney, Australia. Unlike the Spirit who stays in Australia year-round, the Legend spends just part of the year there. It works out well since the southern hemisphere’s summer season for Australia comes during the northern hemisphere’s winter and cruises from Seattle where the Legend will spend the summer cruising to Alaska are seasonal. Sydney has excellent public transportation. You can take a train from Sydney’s suburbs or the airport to Circular Quay where the ship docks. To book an Australian cruise on the Legend (or Spirit), visit Carnival.com.au, and for Carnival cruises out of America go to Carnival.com. The Legend is a Spirit Class ship, built in Finland and launched December 17, 2001. It was delivered to Carnival on August 14, 2002 and has Panamanian registration. The Legend has 12 decks, and was the first Carnival ship to offer alternative dining and a wedding chapel. The theme for the decor on the Legend is legends. The stairways had paintings or sculptures in the center and vases in glass cases on the sides. It’s a long climb to the top of the green thunder waterslide. The Legend undertook a major drydock in 2014 with refurbishing for the season in Australia where $47 million dollar Aussification improvements included additions like the green thunder waterslide, an enhanced gym, and some of Carnival’s 2.0 upgrades such as the Red Frog Pub which serves as a gathering place for things like trivia games as well as a place to buy drinks. It does not have the pub grub food menu found on ships like the Breeze though. The green thunder waterslide is quite different from any other cruise ship waterslide I’ve seen. At the top you step into a little enclosed capsule. You stand there and then all of a sudden the bottom drops out from under your feet and you whoosh down the slide so fast you are at the end practically before you even knew the ride began. The ship also has a yellow waterslide and a children’s splash park with small waterslides. The children’s splash park has little waterslides. The spa on the legend does not have a hydrotherapy mineral pool or heated ceramic chairs, but the locker rooms in the spa/gym area have a sauna and steam room available for free and use of the hot tub in the gym area is free as well. The spa offers a range of treatments from haircuts and facials to a wide variety of body treatments and massages. Spa appointments cost extra, but use of the gym is free. The gym has a variety of fitness equipment including treadmills, exercise bikes, and elliptical cross trainers. First person in the Red Frog Pub each cruise gets a free drink. Regular nights – No cut-off jeans, men’s sleeveless shirts, gym or basketball shorts, baseball hats, flip-flops or bathing suit attire. Elegant Nights – In addition to the above, no jeans, shorts, t-shirts or sportswear. Carnival Australia’s dining times start a bit earlier than on Carnival ships in America with your time dining running from 5:30 to 9:00 and standard dining times with early seating at 5:30 and late at 7:45. Carnival Australia has a Mexican Fiesta theme night where guests are encouraged to come to the dining room dressed in Mexican or Caribbean style clothing. The menu that night is Mexican food with dessert choices that include a chocolate chipotle pudding which is definitely worth ordering. It resembles a fancier version of Carnival’s signature dessert, the chocolate melting cake. The pie station – an excellent addition to the Lido. Food differences include some unique menu items in the dining room and a Pies and Snags station on the Lido which serves meat pies, sausages, and the best French fries onboard. The Lido also had trays with packets of Vegemite available with the breakfast condiments. If you ‘re not Australian and you haven’t tried Vegemite consider yourself lucky. It’s probably something you have to grow up with to like it. The Legend’s upscale pay-extra restaurant resides in the funnel, accessed by a glass stairway from the Lido Buffet. In Australia it was called Nouveau. For the Australian sailings they also added a pay-extra seafood restaurant called Freshie’s to one of the outside grills at the end of the Lido Buffet by the pool. Another food difference involved milk on the Lido, which on most ships is found in cartons at breakfast. The Legend had no milk in cartons, but instead had milk dispensers available all day on the Lido, probably because Aussies tend to like milk in their tea and coffee. The Legend’s Club Merlin Casino is decorated in medieval style. In Australia the Casino is smoke free. Some things are done differently at Carnival Australia. It’s too bad some of the changes like no smoking anywhere inside the ship including the casino and free water dispensers on every bar aren’t done on all the ships. Both are due to Australian law though. 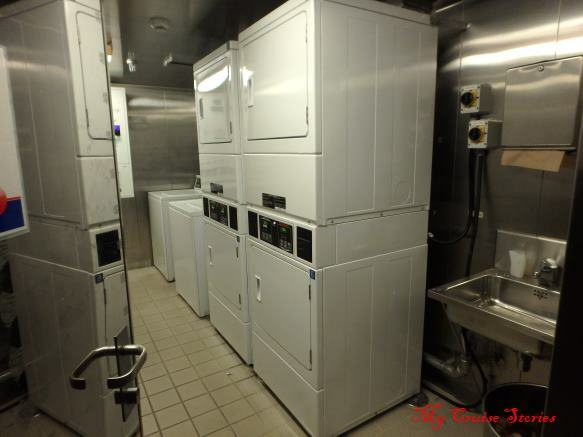 Like all of Carnival’s ships, the Legend has launderetts on some passenger decks. No coins needed, just the sail & sign card. When booking on Carnival Australia, the tips are incorporated into the cruise price because Australians are not accustomed to American style tipping. They don’t tend to tip at all so some areas of service are a bit lax since the crew is not working for tips. We had excellent service in the dining room, but our waiter knew we were Americans. He gave us super speedy service on days we had somewhere to go right after dinner and asked for it. And yes, we did leave him a good tip the last day. The stateroom service was acceptable, but not quite up to the standards of Carnival America where the stewards know that outstanding service brings better tips. In fact our steward seemed quite surprised to receive a tip at all since that is not the Aussie custom. The Atrium, found at the center of the ship. On Carnival America the room service is always free. Most Americans will give the delivery person a few bucks tip. In Australia the room service costs money because those employees live mainly off tips on ships sailing out of America and Aussies aren’t used to tipping. Carnival Australia does not sell alcohol packages because Aussie law prevents promoting alcohol. They don’t have a sail-away party because people didn’t participate when they tried it. Leaving Sydney provides such spectacular views that people are most likely too busy taking great photos of Sydney’s landmark bridge and opera house or even of the city skyline to attend a party as the ship pulls out of the harbour. There’s lots to do on cruise ships. 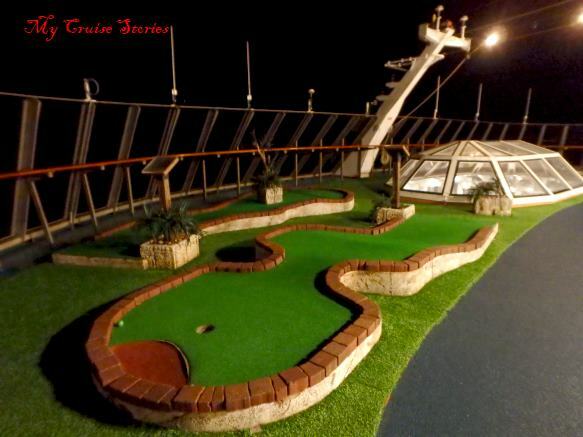 The Legend’s activities include mini-golf. While in Australia the ship uses local comedians in the Punchliner comedy theater. One said he lived in New Zealand, but most came from Australia. Our whole group including my 3 and 5 year old grandchildren really enjoyed the early evening family friendly comedy shows. Later in the evening they have adults only performances. Cruising out of Australia, the differences aren’t just in the ship or the food. Some tend more to follow the attitudes of the people. One of the entertainment staff said the games are sometimes hard to get going because everyone wants to watch someone else so nobody wants to go first. Once a game gets going people seemed to join in though. The Legend has a lot of intricate tile patterns in the decor. We were quite surprised to find different rules involving things passengers can bring onboard. Power strips are a common item many cruise passengers normally bring since a lot of the ships have just one outlet in the room. On the Legend out of Australia they confiscated ours and left a note saying it was a prohibited item that we could have back at the end of the cruise. A crew member said they consider it a fire hazard, but had no idea if that is due to the different power voltage since she was unaware people use them all the time on cruise ships in the USA. They also confiscate things like walkie talkies because of interference with the ones the crew use. Passengers accustomed to bringing a couple bottles of wine on board will find that gets confiscated as well since it is not allowed on Carnival Australia. We had a great time on the Legend. Cruising is starting to become quite popular in Australia and they are lucky to have the Legend and Spirit providing some more affordable options. This entry was posted in Australia, Carnival, Legend and tagged Australia, Carnival, cruise ship, Dress Code, Legend, waterslides, what's on board. Bookmark the permalink. Cruises always are fun, no matter what ship it is or where it goes. Cruising in Australia is on our to-do list. Seems you enjoyed this ship! I enjoy every ship. Australia is a different cruise experience, but fun. Cruising is relatively new to most Aussies, but catching on fast over there. Interesting that you say it’s new to the Aussies because I’ve encountered many Aussies when cruising. Perhaps I should have said the cruise industry in Australia then. It’s becoming a big thing with more cruise lines and ships sailing from Australia. It took a poker cruise to get my husband on a cruise ship, but once he went he loved it. There’s always the option of cruising with other relatives or friends too. Cruising is not my thing, but I am sure that my sister and brother-in-law would find their bliss on that ship. It looks pretty spectacular. Does the entertainment include staged plays? There aren’t any plays, but there are Vegas style shows with singing, dancing and fancy costumes. The Legend had a good magic show one night and a Hollywood style game show (with audience participation) as well. There’s also a nightclub and plenty of bars with music – even a piano bar. People who want to find places to dance. There’s something for everyone. Anyone who gets bored on a cruise would probably be bored anywhere. Maybe people would like the sail away party if it was on an outside deck. I mean most people were out there anyway ( until it started pouring). The sail away parties are outside since the point is to watch the ship sail away from the dock. I haven’t ever gone to one, but would imagine it could be hard to get good pictures with a lot of people in a confined area because not everyone could get a good spot on the rail. It’s a good looking ship. The meat pies sound good too but what do they mean by snag? I have never heard any food item being called a snag before. About a week before we went on the cruise an Aussie mentioned how they used to call sausages snags, then we get on the ship and there it is, pies and snags serving meat pies and sausages. That must be it, starting on vegemite early. My daughter’s Australian born kids like it, but she’s American born and never will even though she’s lived there for years. Sydney is a beautiful place.